Engineers should make great things. In our case, we made a great place to work. Take your career to the next level with Turner. At Turner Integrated Systems you’ll find a supportive, fast-paced environment, where employees are able to develop and utilize their natural talents and interests. We are always looking for self-motivated, independent people who can offer leadership to our colleagues, clients, and the community. We believe it is our responsibility to provide training and mentoring to allow your responsibilities to grow as quickly as possible. We consider it your role to take advantage of these opportunities and accept as much responsibility as you can handle. With greater responsibility comes bigger challenges, but also greater rewards. 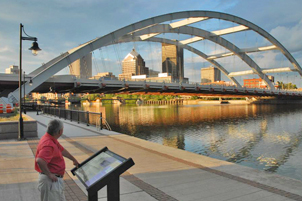 Rochester and its environs offer big city cultural attractions, excellent school systems, and a superb quality of life. One thing we hear over and over: It’s a fantastic place to raise a family. And we couldn’t agree more. Learn more about Rochester.